Hainan Rendez-Vous 2012, China’s leading super yacht and business jet show, will be held on 5th-8th April in Sanya. On the morning of 28th March, the first super yacht ‘MUSE’ arrived at Sanya. The pavilion of the exhibition is almost done, and the following decoration is underway. Besides being a high-end and artistic show, this year’s exhibition will be more ecological with trees that will be moved into the pavilion. There will be 230 exhibitors attending the Hainan Rendez-Vous 2012. To save space, the showcase was designed to be two-storied. Many brands especially invited some famous designers to build exquisite showcases for them. 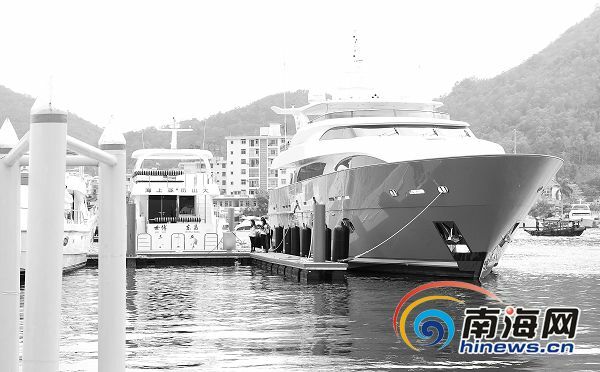 At 11:20am, the luxury yacht ‘MUSE’ came from Taiwan and berthed at Sanya Hongzhou International Yacht Marina. The luxury yacht ‘MUSE’ which is over 100 feet, was produced by Jia Hong Yacht Company. Another 164-foot super yacht NorthernFUN, as the largest yacht in the exhibition will arrive at Sanya on 30th March.